The Tories know that their treatment of Windrush citizens has been absolutely despicable, but instead of taking personal responsibility for it and resigning, they've resorted to the most ridiculous campaign of bluster, smears, misrepresentations, and outright lies. When a whistleblower revealed that the Tories had deliberately destroyed the archive of landing cards from the Windrush generation the first Tory instinct was to lie their way out of trouble. The Tories initially tried to claim that the archives were destroyed because of Data Protection concerns. The first thing to note is that this is a Tory government that wilfully sold off our private NHS medical data to drug companies and health insurers without our consent. To hear them suddenly pretending that they care about data protection laws is most absurd. The next thing to note is that Data Protection rules have a very clear exemption for material of historical importance. You'd have to be completely cracked to imagine that the boarding cards of the Windrush generation who came to help Britian rebuild after WWII had no historical significance whatever and needed to be lobbed into a skip. And one final point on this ridiculous excuse is that *if* the Tories know for a fact that data protection concerns really were their motivation for destroying these documents, they know who authorised the destruction, but they're hiding that information from the public domain presumably because it's harmful to their party. When Theresa May was cornered by Jeremy Corbyn on the destruction of the Windrush boarding cards she resorted to the age-old Tory tactic of misdirecting attention with smears. She said she was going to ignore the question because Jeremy Corbyn has supposedly "let anti-Semitism run rife through his party". 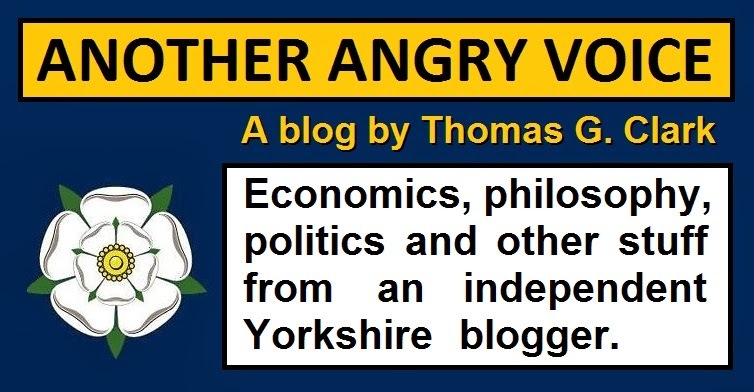 The facts of the matter are difficult to square with Theresa May's smear-mongering: Anti-Semitic views are very much more common in the Tory ranks than in the Labour ranks. Labour Party members are significantly less likely to hold anti-Semitic views than the general public, rates of anti-Semitism have declined dramatically since Jeremy Corbyn became Labour leader in 2015, and last but not least Theresa May's vile anti-immigrant 'hostile environment' legislation was all about attracting the extreme-right ultranationalist blue-kip demographic who are by far and away the most anti-Semitic demographic of all. The legislation that has been used to dehumanise, deny employment and healthcare, and deport Windrush citizens was introduced in 2014 by Theresa May. She was warned of the dangers at the time. In the 3rd reading parliamentary debate Diane Abbott clearly raised the problem of Theresa May's harsh new immigration rules being used against British citizens, but Theresa May just fobbed it off with a load of evasive waffle. Theresa May was warned at the time that her attack on immigrants could end up wrecking the lives of people who have every right to live here, she ignored it, and now she thinks that she can just say "sorry" and wash her hands of responsibility, rather than offering her resignation like anyone with a shred of integrity would do. 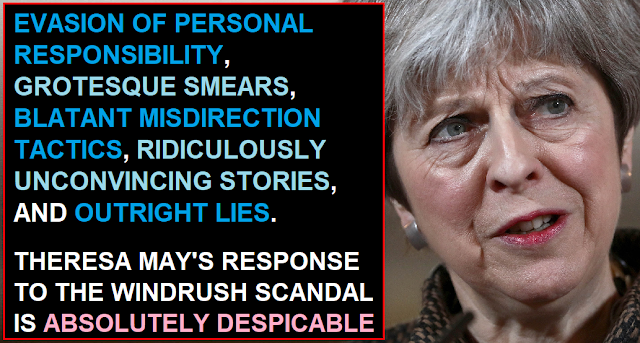 Despite the Home Office having admitted that they destroyed the Windrush landing cards Theresa May decided to blame the decision on Labour with a truly ridiculous piece of misdirection (one that was lapped up and uncritically reported by the right-wing press and the BBC). The misdirection involved switching two very distinct decisions. In 2009 the Labour run Home Office made the decision to move out of the Croydon building in which the Windrush landing cards were kept. And in 2010, under Theresa May's watch, the Home Office made the decision to destroy the cards rather than find a place for them in the new building. By switching decision one and decision two to blame Labour for her own department's decision, Theresa May is once again assuming the general public to be a total bunch of irredeemable half-wits who couldn't tell the difference between a blue frog and a yellow frog because they're both frogs. Another assumption they're making is that we're so dim-witted that we'll simply forget that they openly admitted destroying the documents just one day previously (using their absurd data protection story). If you're the kind of person who abhors institutional racism and believes that people should take personal responsibility for their own errors and misjudgements, Theresa May's actions in regards to the Windrush scandal should sicken you to the core. If however you're totally chilled about institutional racism and prefer your politicians to resort to ridiculously responsibility evasion, unconvincing stories, blatant smears, cynical misdirections, and outright lies the instant they get caught doing anything wrong, then Theresa May's behaviour should have you purring with pride in a job well done.